We might end up with a Trump presidency that has polarizing effects domestically and depolarizing effects internationally. Espanol. 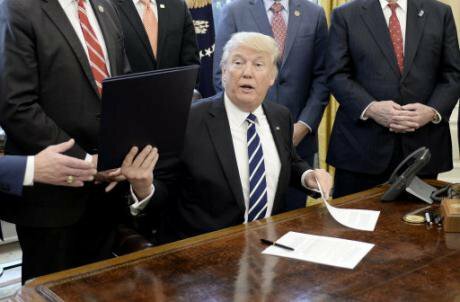 Donald Trump signs H.J. Res 41, relating to Dodd-Frank legislation in the Oval Office on February 14, 2017. Pool/Press Association. All rights reserved.Trump’s election marks the end of the long phase of American world hegemony. Despite the electoral slogan “Make America Great Again” and the great expectations this may have generated, his presidency will presumably be characterized by an overall retrenchment. Many different interpretations have been provided on the reasons of Trump’s success ranging from populist framing to FBI support. Contrary to the mainstream debate, I see a more fundamental reason underpinning his victory: the changed costs/benefits balance in the US role in the world. The theory of hegemonic stability holds that at some point the hegemon will start to decline due to the increased costs of the management of the system which outbalance the benefits the hegemon gains out of it. The costs of the management of the system have in fact been accumulating in the last 4 presidencies. During the Bush administrations, security costs due to the military operations in Afghanistan and Iraq have, among other damage, impacted negatively on the US government. Equally, during the Obama presidencies costs due to economic stimuli have increased the overall debt of the country. As predicted by hegemonic theory, we finally come to a point in which the costs became too heavy for the citizens, or rather their perception of this becomes more evident, so that they start to protest and demand a change. This was intercepted by Trump much more than by Clinton, with Trump stepping back to decrease the costs of international projection. So-called “imperial overstretch”, formed much earlier, led Trump’s electorate to seek less international costs (and possibly, but less likely, more domestic benefits). Hence, the promised withdrawal from a number of Free Trade Agreements, the discussion of the terms of NATO participation, cancellation of the environmental deals etc. From this perspective Trump’s election has to do with a much longer trend of international order rather than the specific time-lapse of the electoral campaign, a trend of dis-engagement that had already begun during the Obama administration and will now be more clearly visible with Trump. The system in which we have been living in the last 70 years was created in large part by the US leadership. The UN system, Bretton Woods Institutions, NATO, and WTO are all institutional arrangements that have been strongly promoted by the post WWII hegemon and that have been preserved in life thanks to continuous support by the USA. Now all of this is put into question by the resistance of the newly elected president to engage in and with these multilateral organizations. Trump will most likely have a more unpredictable, possibly turbulent behaviour vis a vis all of these institutions and this will lead to their transformation and perhaps for some, to their marginalization. Other significant elements in this jigsaw puzzle have to do with the phenomenon of globalization. It is because of global transformation in production chains, the relocation of multinational corporation abroad coupled with the possibility of (re-)importing goods, and the subsequent loss of jobs that a component of the middle class has been badly affected by unemployment. But it is also thanks to globalization that China is rising fast and challenging the US leadership in economic, but also increasingly in political and military terms. It is clear by now that the policy choice for globalization taken by the US leadership in the ‘80s (republican) and ‘90s (democratic) was beneficial only at the beginning, but later turned out to be detrimental to the power position of the USA in the world economy. It is widely recognised that India and especially China are the real winners in the game of globalization, hence closing the gap with the west. Russia is an additional element in this calculation. This new would-be multipolar system, deprived of the overall western master plan, is left to pure bargaining, pure transactionalism played with ad hoc games, which is very much in line with Trump’s overall attitude to socio-economic engagement. And yet, this might have a de-polarizing effect, a de-escalating consequence in terms of the current world tensions that have grown in the last few years. Here I am thinking especially of the west-Russia split. Without a hegemonic power pushing for a specific world order, a more balanced system might emerge. We might end up with a Trump presidency that has polarizing effects domestically and depolarizing effects internationally. The line of march is clear: either new competition based on multipolar rivalry which might possibly escalate into conflicts, or the opening of new channels for dialogue, might lead to a foundational phase in which innovative rules of the international games are written by western and non-western powers together. It will be up to Trump and the other leaders to steer the way and to take a decision on which way to go.